Another collector's item for jazz vocal fans from SSJ records! 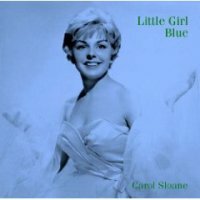 This is one of the earliest recordings of star singer Carol Sloane, made while she was still with the Larry Elgart band, before she recorded her CBS debut, Out Of The Blue. A part of the same session has been released by SSJ as Hush-A-Bye, but the tracks on this latest historic recording have never been available before now. With tasteful and simple backing mainly provided by guitarist Chuck Wayne or Bucky Pizzarelli augmented sometimes by bass, trumpet and celesta, the young Sloane (22 at the time of recording) actually gives a very strong performance. A must-have item for fans of Carol Sloane and fans of vocal jazz! Recorded in 1959 in New York. This CD in paper sleeve (mini-LP) package was released in Japan by SSJ Records on August 19, 2009. HQCD uses higher-quality materials for better sound, and is compatible with all regular CD players.